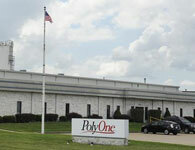 PolyOne Corporation, a leading provider of specialised polymer materials, is expanding operations in India. Currently under construction is the new state-of-the-art facility in Pune, India that is intended to manufacture specialty materials, including solid masterbatch, liquid colourant and additives. The facility will operate development labs and the sales and customer service centre for the region, and it is expected to open in the first quarter of 2014. Vikas Vij, Managing Director for PolyOne's operations in India affirms that there is an increasing demand for advanced specialty solutions in the country, particularly in automotive, packaging, wire and cable and healthcare sectors. The new plant, he says, can deliver a broader range of solutions as well as improve delivery times to its customers in India. Robert M. Patterson, Executive Vice President and CEO, adds, " Our investment in India is consistent to the firm’s globalisation strategies and augments other recent announcements, including a new joint venture specialty colourant facility in Jeddah, Saudi Arabia, and plans to begin thermoplastic elastomer production in Sao Paulo, Brazil."